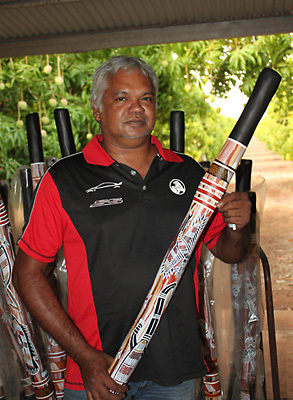 Growing up in Katherine, Northern Territory Rodney would spend his school holidays with his father in Ngukurr, east of Katherine. 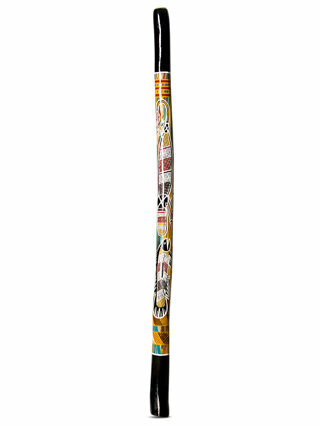 It was during this period that Rodney first began to paint, learning from artist Kenny Wark, who also taught him how to make didgeridoos. Moving to Adelaide in his teens Rodney spent 3 years working as an apprentice carpenter, returning to the Northern Territory to spend some time working in Bulman Arnhem Land. It is during this time he further developed his artwork and refined his technique - being influenced by the classic cross hatching style of Arnhem Land and learning to paint in the “old way”. It was at this point Rodney began taking his artwork seriously and pursuing it as a full time vocation - quickly establishing himself as a talented artist as well as a fine didgeridoo maker and wood carver. He has been painting now for over 15 years, having spent the last few years in Katherine Northern territory where it all began. He predominantly paints the wildlife of the area and the experiences which come with the bush lifestyle while still being heavily influenced by the cross hatch style of Arnhem Land. 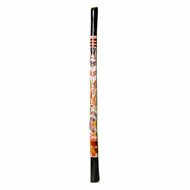 This didgeridoo has been hand picked for its sound quality and artwork by the Spirit Gallery team on their most recent didgeridoo buying trip to the Top End. It is made from a native Australian Eucalyptus tree that has been hollowed by a termite and then worked on by the maker to turn it into an instrument. In its final stage it has been hand painted by Rodney and sealed with a gloss finish to protect the artwork, allowing it to be used as both a serious instrument and a piece of art. 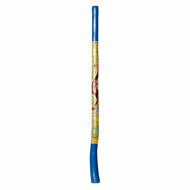 Great affordable genuine Aboriginal painted eucalyptus didgeridoo!